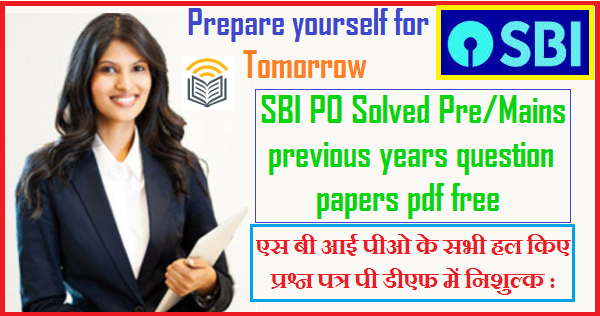 SBI PO Previous Year Papers: For aspiring candidates like you who wish to crack the SBI PO exam, solving the SBI PO previous year papers is a must. If you wish to not only clear the exam but also beat the competition in the fight for one of the most popular jobs in the country, solving the SBI PO previous year papers will be a huge advantage. It helps you to be aware of the exam pattern, marking scheme, the difficulty level of the paper, and the type of questions that will come. Moreover, with the latest pattern changes introduced (in 2016), it is of paramount importance that you go through the SBI PO previous year papers. SBI PO Previous Year Papers: Why is solving SBI PO previous year papers so crucial? Having knowledge of the nature of the questions that will come in the paper will go a long way in your SBI PO preparation. In this post, we shall help provide SBI PO previous year papers for the past 5 years. This will help you to compare between the old and new SBI PO exam pattern. It will also help you narrow down the important topics from the vast SBI PO syllabus. 1. Go through the entire SBI PO previous year papers once to have a clear idea of the difficulty level of the paper. 2. Begin with the section and questions which you find easy and are confident about. 3. If you don’t know the answer to or are taking more time to solve a question, leave it and move on to the next one. 4. Once you have attempted all the questions you are confident about, go back and try to solve the others. 5. After completion of the SBI PO previous year papers, identify the areas you need to improve on. 6. Go through the solutions and explanation of every question where you made a mistake or where you struggled to solve and revise the related concepts. 1. The pattern of SBI PO exam changes from time to time. Going through the SBI PO previous year papers will help you understand the trend. 2. Solving SBI PO previous year papers will give you an idea about the nature of the exam – the difficulty level of the questions. 3. By solving SBI PO previous year papers, you will come up with the best strategies for an effective test-taking. Here we are providing you the best possible combination SBI PO Pre/Mains Exam of previous years for English Language, Quantitative and Reasoning Ability question paper based on the communication with aspirants who attended the exam.